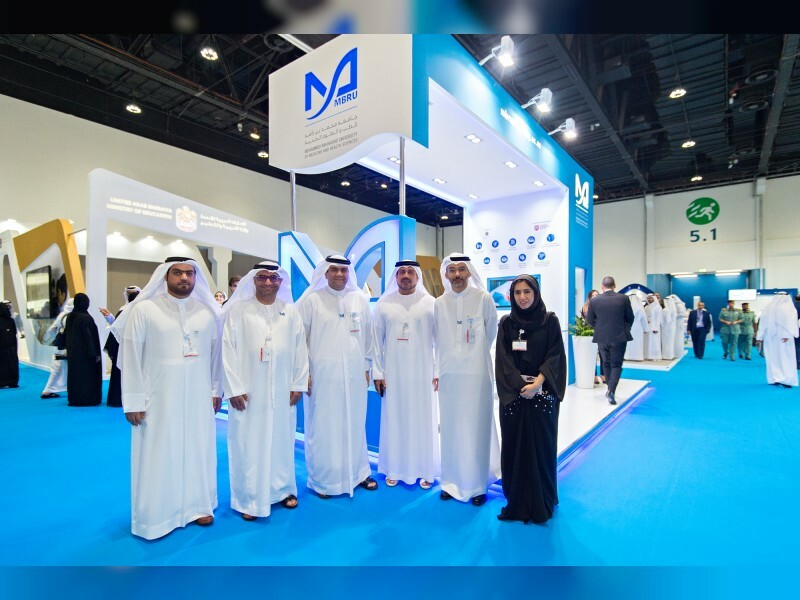 ABU DHABI, 21st November, 2017 (WAM) -- Under the theme, "Nourishing Minds, Flourishing Nations", the Mohammed bin Rashid University of Medicine and Health Sciences, MBRU, is taking part in the Aqdar World Summit at the Abu Dhabi National Exhibition Centre, ADNEC. Aqdar World Summit officially opened today under the patronage of H.H. Lt. General Sheikh Saif bin Zayed Al Nahyan, Deputy Prime Minister and Minister of the Interior. The 3-day event runs until Thursday, November 23rd. The exhibition is the first ever platform created for people from all over the world on moral education. The summit’s theme is the culmination of national efforts seeking to unify youth, build a conscious generation of students, which will enable them to cope with present and future challenges of the world. The Aqdar World Summit brings together leaders, educators, students and parents to share their expertise on shaping the future of youth. Ahmed Al Awadhi, Director of Student Services and Registration, said, "We’re very happy to be here today, the Aqdar World Summit is a great platform to meet academicians, parents, students, and industry professionals all in one place. At MBRU, we emphasise moral education and understand its importance in our society. Part of our admissions process is conducting multiple-mini interviews, MMI’s, which not only test the student’s intellectual knowledge but also their empathetic side." "At MBRU professional education is a crucial part of our curriculum. At the beginning of their programme at MBRU, our students go through an official 'White Coat' ceremony where they receive their white coats and affirm their commitment to a professional career in medicine. In the oath, they commit to treat the ill to the best of their ability, to preserve a patient's privacy, and to respect and treat patients of all backgrounds. We are happy to be part of the dialogue on moral education in academic institutions regionally and internationally." Professor Alawi Alsheikh-Ali, Dean, College of Medicine, MBRU. The Aqdar World Summit is supported by the Court of H.H. Sheikh Saif bin Zayed, the United Nations Office on Drugs and Crime, UNODC, and is organised by the Khalifa Empowerment Programme for Students "Aqdar" and Index Conferences and Exhibitions.